Ok. After several months of hibernation, I have now managed to find a C128D with keyboard in front of me again. So this weekend, I went back to some old projects I had waiting on the back burner. My main project is still at the early experimentation stage, but as an aside, I revisited the old high resolution settings and have found an alternative method of setting 1024 pixels horizontally which causes less strain on the monitor, if not the VDC itself. Basically, I was 'stealing' sync pulse time to force more characters into the frame. When getting to the 127 total char limit, the coloiur luminance/saturation were becoming very subdued and the monitor was on its display limits. What I have now discovered is that I can actually increase the total chars (reg 0) up to 160 with some CAREFUL manipulations of the h.sync position and then the total displayed chars can be increased up to 128 without actually cutting into the h.sync pulse width! This is far more 'monitor friendly' and there may even be a way around the char corruption issues. (I havent had a chance to test that side of things though). This is not rolling or moving at all. Just garbled! Please note: milage may vary on your hardware! With that in mind, this was all possible on my more fragile C= Ranger monitor, so a lot of you should have a fair chance with this! I havent tried on any of my more bulletproof Sony PVM's yet. (I cant find my RGBi >RGBa lead ATM). And as a bonus, it looks like using this method could possibly result in yet higher attainable horizontal resolutions! Displayed chars is set at 80, so there is around 100% more space available to the left/right. As you can see (probably more so in the first picture), either the char/dot clk or the monitor pixel width is shot, with pixels getting very much smaller the nearer to both edges the chars get. I will try to alleviate this, but at least you get to see the higher res picture, warts and all. TLDR: Less stress on the monitor, more for the VDC! More updates when I have more time! This is great work. Are you going to put it into interlace and push the 200 a little higher too? The VDC theoretical horizontal limit is 2048 pixels (or 255 chars) and Im not sure that we can get anywhere near that, but I will have a good try! The problem for me at the moment, is that pushing up the register values at this level and from basic, is like playing a game of chess with the VDC. Moves have to be strategically thought out and one wrong turn brings down the whole deck of cards. An assembly program *MAY* be ok if you set everything to full and write it all just after the v.blank period...who knows.. Im coping doing it in basic ATM. Add to that the weird compression that I am getting at the extremes of the screen. I do think this can be solved though. I actually had it running at 1280x200 but didnt take a photo and went one setting too far and it all went wrong. So I imagine 1280x296/592i should be reachable. BTW, hows the isometric game coming on? It's not atm. Been busy with work, trying to assemble video adapters and family life. I need to sit down and spend a lot of time working out my software sprite code. I need to be able to shuffle bits around. The idea is to have a 4 character tile and be able to position it pixel by pixel in a 9 character "sprite"
I'm reading it like a miracle... I'm preffering VDC in all ways. I don't know what went wrong in 8563 design at cancelling Commodore 900 project - it has 8563 too, but dedicated 128K RAM. I don't understand how could VDC work with addressing it, but it provided for C900 1024x800 graphic mode. I'm your fan and hats off. I will watch and try it with converter to VGA. Thanks Miro ...I appreciate that. As for the C=900 machine you keep writing about... 1024x800 is a rather non standard resolution. Horizontal pixel count can be pretty much anything and will still manage to comply with the PAL/NTSC standards (e.g. Amiga ECS super Hi- res /laced @ 1280x256/512i PAL or 1280x200/400i NTSC, and I think the Amiga can do up to ~1440x200/256). I can try setting these and it should still work on a PAL/ C=128 CGA monitor as originally intended (1084,ect). Theres no reason why I couldnt apply my new method to the vertical total/displayed (set to 38/25 as standard). Im quite happy to do this, but are theret many people with a setup that can display a CGA type C128 VDC output? Out of these, how many, I wonder, have a true CRT multisync? 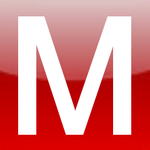 Is anyone using a CGA to composite video converter? Maybe I can try setting some 'standard' VGA type modes for people who have digital to analog RGB adapters and a modern PC flatscreen? (e.g. 1024x600, 1280x800, 1280x1024??). 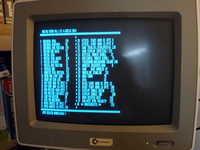 I wrote about C900 not for reaching its resolution - I was writting it for lost VDC 128K RAM. In case of NTSC/PAL - in Amiga it was very important. But we have here not any restricted area. For example I'm using also mode 600x800i and 800x600i pixels (by Torsten Kracke aka tokra). Your solution shifts VDC to wonderful resolution... 1024 and even 1280. 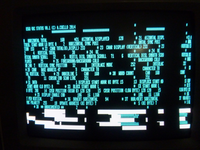 - RGBI2SV - RGBI to S-Video - this is answer on your Q if anyone use CGA to composite conversion. It would be hilarious if we could match/beat highest Amiga modes with MORE colours on screen too! I can do some more testing this weekend. Tokra did some great work getting a VGA compatible output from the VDC however he had to lower the horizontal resolution. If we could push the 128 to even match the original 640 and output 31khz that would be amazing! It would then be possible to hack 80 col software to work native on VGA monitors with as little as a few resistors to connect to the 128 (minimum). I love seeing all this work pushing it to it's limits. I would be exceedingly interested in any further work on using VGA monitors without scanrate conversion. Since the VDC is on a 16 Mhz pixel clock, you just cannot get 640 pixel width and 31.4686 kHz for VGA. So, with register 0 set to 63, you just cannot get more than 63 * 8 theoretical pixels per line (which must include the horizontal-sync-area as well). 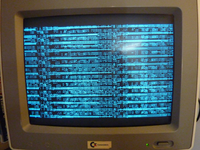 The monochrome-VGA-mode I created uses 50 * 8 = 400 pixels width. (reg4 + 1) * (reg9+1) + reg5. (255 + 1) * 2 + 1 = 513 lines only. But this still works although you really have 60.91 Hz. For 8x3 mode it looks a lot better (172 + 1) * 3 + 2 = 521 which gives 59.98 Hz, which is pretty close to the original 59.94 Hz.